It should not be too hard to understand the function of shock absorbers. Their purpose is to help absorb the shock which comes from driving a vehicle on the road. After all, there are a lot of uneven surfaces on roads. If you drive on a road that is bumpy or gritty, you’ll want your suspension and springs to be protected from this impact. In addition, you’ll want your tires to stay balanced and leveled on the road, no matter if you’re driving or stopped. If you don’t have a functional shock absorber, then you will experience a lot of unpleasantries as you drive. Given the nature of the shock absorber’s function, it is easy to know when it is not working right anymore. There will be several symptoms which present themselves as you drive your vehicle. These symptoms will escalate from just a couple of symptoms to several more. Your driving will be ultimately impacted as a result. That is why it is better to do something about the symptoms before they get worse. This will reduce your overall costs of repair or replacement of the necessary components. Below are the top 5 symptoms of a faulty shock absorber in your car. 1) Uneven Tire Condition – Your vehicle’s tires should all be aligned steadily and evenly on the road. Your shock absorbers help make this possible because they don’t let the impact from road interfere with the balance of the tires. However, if your shock absorbers start to go bad or become faulty, then you may notice that some of your tires are more worn out than others. This will be apparent when you study their treads and see that some of the treads are flatter than others. Once that happens, your vehicle will bounce repeatedly as you drive. 2) Fluid Leak – Shock absorbers have suspension fluid inside them. There are seals which ensure this fluid doesn’t leave the shock absorbers. If the seals were to get damaged or excessively worn out, then a fluid leak would occur. The leakage may be minimal in the beginning but eventually, you will see the leaky fluid all over the road. Worst of all, your shock absorbers will no longer be functional. 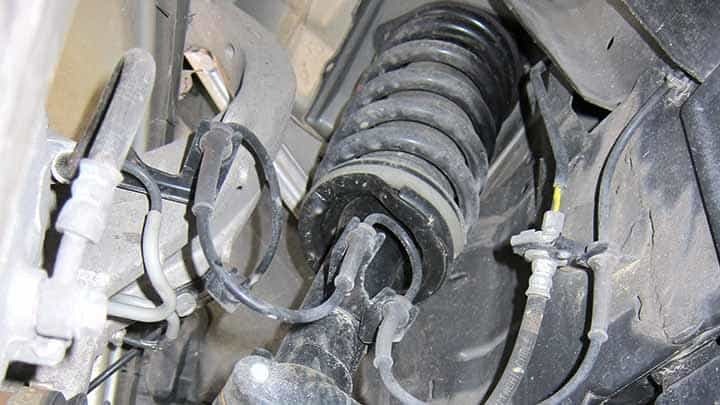 Check the seals of your shock absorbers to see if their condition is bad. If so, then you’ll need to get new absorbers. 3) Weak Braking – You rely on your braking system to respond immediately after you step on the brake pedal. But if you notice there is a few seconds delay in the response time of your brakes, then you likely have a faulty shock absorber. This requires immediate attention from a professional mechanic. Otherwise, your life and the lives of others on the road could be in jeopardy. 4) Swerving – When you make a turn with your vehicle, there should not be any swerving. But if you experience swerving as you turn, then it can likely be attributed to a faulty shock absorber. Some people may assume it is a problem with the braking system because they step on the brake pedal as they turn. In actuality, it is due to the shock absorber’s inability to keep the vehicle’s weight centered and balanced. 5) Vibrations in the Steering Wheel – Shock absorbers have valves and seals inside of them. If these valves and seals were to get damaged or worn out, they could leak fluid. This will interfere with the stability of the steering wheel. You will feel lots of vibrations as you hold the steering wheel with your hands. If you drive on uneven terrain or bumpy roads, you can expect much worse vibrations to be felt.